Losing a pet is a sad and stressful situation for everyone, including the other dogs in the household. You may not realize it, but dogs do grieve the loss of a companion. 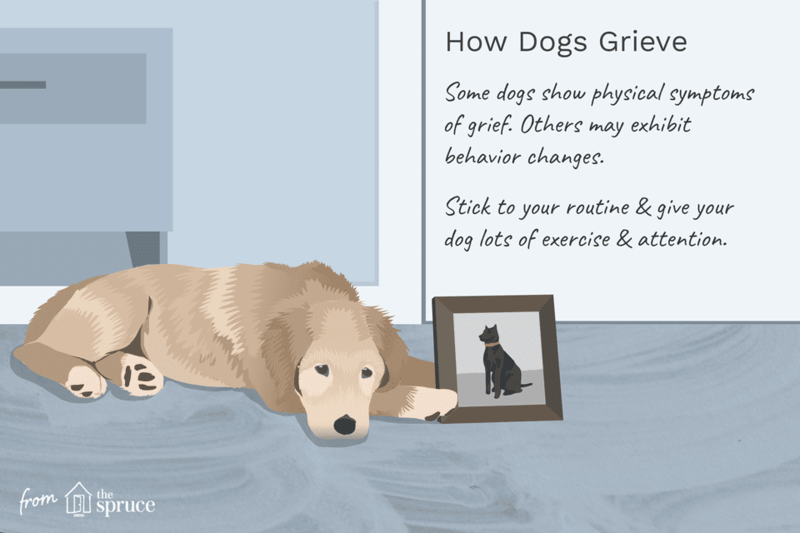 If you are dealing with the death of one of your dogs, there are several things you can do to help your remaining dog (or dogs) get through this difficult time. Personality changes. Some dogs may seem to change some of their behaviors. If the dog that passed away was a leader, the dog left behind may feel it's now his responsibility to take on that job. You may notice him barking more at passersby or acting more outgoing and confident. Or, you may notice your dog is quiet and withdrawn. Physical symptoms. The dog left behind may have physical symptoms in response to the loss. Some commons symptoms include lethargy, loss of appetite, and sometimes even illness. No signs. Some dogs may not show any signs after losing a companion dog. This doesn't mean the dog is not experiencing some kind of grief. No matter how your dog reacts to the loss of another dog, he is probably feeling stress over the changes in the household. One of the best ways you can help your dog adjust to the loss is to stick as carefully as possible to his normal routine. Continue feeding him and walking him at the same times. Sticking to the usual schedule can help a great deal in reducing his stress. Keeping on a routine can also help you cope with your own grief. Chances are the dog that passed away played a large role in the day-to-day life of your other dog. They may have played together or napped together. Losing this relationship may leave the remaining dog feeling bored and anxious. You can help your dog deal with boredom and anxiety by providing him with more exercise and mental stimulation. Some things you can do include going for an extra walk each day, providing plenty of interesting toys, starting an obedience program, and playing extra games like fetch or tug-of-war. You can also just try to make time for extra cuddling and bonding with one another. One of the first pieces of advice many people hear when they lose a dog is to run right out and get another dog. This is not always the right choice. Before you get another dog, there are some things you should consider. Ask yourself whether you're ready for another dog. Your life may have changed a great deal since you first brought your dogs home, and new dogs are a lot of work. Make sure you are absolutely ready for this commitment before ​you bring home a new dog. Make sure your dog will accept another dog. Just because your dogs were inseparable until the day one of them passed away, does not mean the remaining dog will have the same relationship with a new dog. You may want to visit a dog park or plan some doggie play dates with other dogs to see how your dog reacts before bringing home a new dog. Consider letting your dog help select your new dog. If you do feel that you and your dog are ready to add another dog to the family, let your dog help you choose a companion. Many shelters and breeders will allow you to bring your dog to meet their dogs. Allowing the dogs to meet first gives you the chance to find the best companion for your dog.